VIE Healthcare® has delivered significant cost savings to hospital purchased services through our guaranteed margin improvement expertise. Our automated and patented technology reconciles thousands of line item details instantly, saving hospitals and healthcare organizations unnecessary purchased spend caused by billing errors. Not only do we find and save you money, we eliminate your manual process so you can redirect your team to work on better initiatives. This proven, patented technology is called Invoice ROI™. 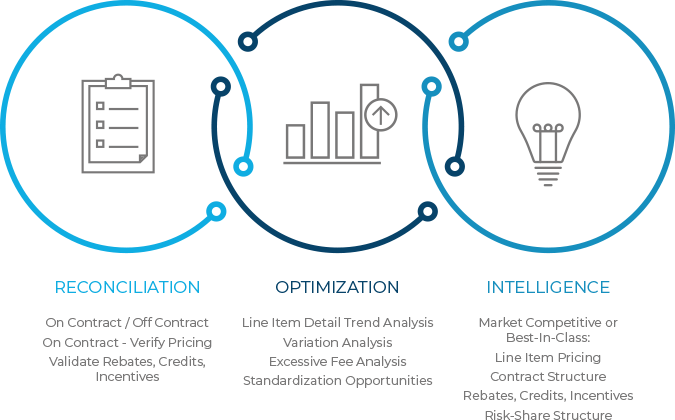 Invoice ROI™ offers invoice reconciliation, contract optimization, business intelligence and an analytics platform with real-time line item contract reconciliation and benchmarking performance provided on a monthly basis for outsourced services. Our process begins with line item reconciliation of the past 12 to 18 months of your purchased services invoices to reveal the hidden costs in pricing errors and off-contract spend that you are not aware of. From there, our experts identify trends in utilization that can increase your costs and provide preventative advice to save your organization money. By moving straight to benchmarking prior to carrying out a line item analysis, significant cost saving opportunities are often overlooked and missed. 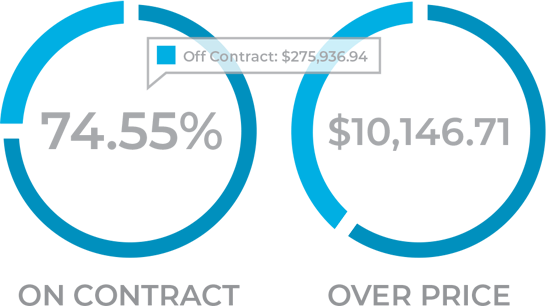 In some cases, up to 30% of hospital purchased spend is either not detailed on the contract or does not match contract pricing. The results achieved through Invoice ROI’s line item analysis cannot be achieved with AP spend. RECONCILIATION: Our technology allows for real-time Invoice reconciliation for outsourced purchased services. Your invoice accuracy is matched to the contract and performed prior to the payment of invoices for real-time corrective action. OPTIMIZATION: Using invoice line item details combined with other data inputs to identify trends, variations, quality and utilization improvement opportunities for pro-active monthly management of outsourced purchased services spend allows for significantly greater optimization of your purchased spend. INTELLIGENCE: Our technology provides you with cost saving opportunities identified by purchased services line item in real-time and on a monthly basis providing you with the intelligence you need for predicting future spending. Invoice ROI™ delivers guaranteed margin improvement and identifies cost saving opportunities for your hospital in real-time. We guarantee your hospital is overpaying for purchased services and the details are buried in the invoice line item data that your team doesn’t have the bandwidth or technology to manage. We can provide you with guaranteed margin improvement. We make our technology do the work for you. No team member training or new software installation required. “We engaged VIE Healthcare to assist us in evaluating and reducing our purchased services spend, a growing segment of our operating expenses. Their patented methodology to compare actual spend to contract spend, using line-item invoice detail, helped us recover hundreds of thousands of dollars related to inaccurate billing. “We have been overly impressed with VIE’s approach to our purchased service agreements. We begin with a retroactive audit of our existing agreements and reconciliation of any discrepancies and overpayments through VIE’s InvoiceROI Technology. From there VIE’s InvoiceROI Technology continues to review invoices regularly to help avoid any future discrepancies. VIE has able to identify hundreds of thousands of dollars in discrepancies. LEARN MORE ABOUT THE POWER OF INVOICE ROI™ FOR YOUR HOSPITAL.